Do you manage your local block’s neighborhood watch program? If so, you know the importance of ordering appropriate neighborhood watch signs with the right messaging. They can help keep neighbors alert as well as deter thieves, robbers and other would-be criminals. But what good are such signs if you are unable to post them due to ill-fitting clamps or faulty hardware? Don’t let such sign-posting snafus take away from the impact of your important neighborhood watch program. 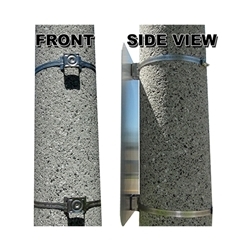 StopSignsandMore.com sells Snap-Lok, Worm Clamp Sign Mounting Kit as well as the actual signs themselves. Such sign mounting kits are difficult to find at local hardware stores. 2 adjustable straps to secure the top and bottom of the sign (most signs come with 2 predrilled holes). Straps are 9/16” wide and 40” in length. 2 worm clamps (already fitted to the straps) that can be adjusted for length and then easily clamped to hold the sign in place. 2 stainless steel flared leg brackets and mounting hardware that are used to affix the sign itself. A screwdriver or wrench is required for installation. A hex head bit and drill is recommended. Need more tips for setting up your neighborhood watch program, check out our on How To Start A Neighborhood Watch.